How exciting it is to think about space and about getting to the moon when you are a young boy gazing far up into the sky. Seeing the stars at night and the moon glowing brightly really makes one think about the wonder of it all. If you have a boy who is fascinated with all things space and even dreams of being an astronaut this is the list for you. These Non-Fiction Astronaut Books will give him a deep look into what being an astronaut is all about. These books are perfect to help enhance your boy’s dream of becoming an astronaut. Read them with him or leave them laying around. You know he will get excited to see new books on a topic he loves. I hope you enjoy this best books for boys list on astronauts! For an illustrated picture book format that is a good choice for young boys, try Man on the Moon . They can learn about the astronauts who first went to the moon. Meet real astronauts in Space Heroes: Amazing Astronauts . This DK Readers book is perfect for young boys who are fascinated with astronauts. DK books have great images and easy to read text. My son enjoyed quite a few of the Let’s Read and Find Out About Science series of books. Floating in Space was no exception. Take a peak into what happens when you are an astronaut on a space shuttle. This one is perfect for sharing the story of the first trip to the moon. Moonwalk: The First Trip to the Moon . It is very visual and informative. Who Was Neil Armstrong? is a highly rated book about Neil Armstrong and the giant leap for mankind. Super engaging with great images and a lot of color How to be a Space Explorer: Your Out-of-this-World Adventure is a neat selection. This will appeal to boys who are a bit older maybe 8+ or so depending on their interest and their reading level. I don’t know about your boy, but mine has always enjoyed DK Eyewitness Books and I really love them. They are packed with information and cover the topics in a way that is fun and very visual. Try Space Exploration for a broad overview of all things space and astonauts. Highly Recommended. The excitement and adventure of space has grabbed many a boy’s interest. Helping them explore (while here on earth!) is something they will always remember. 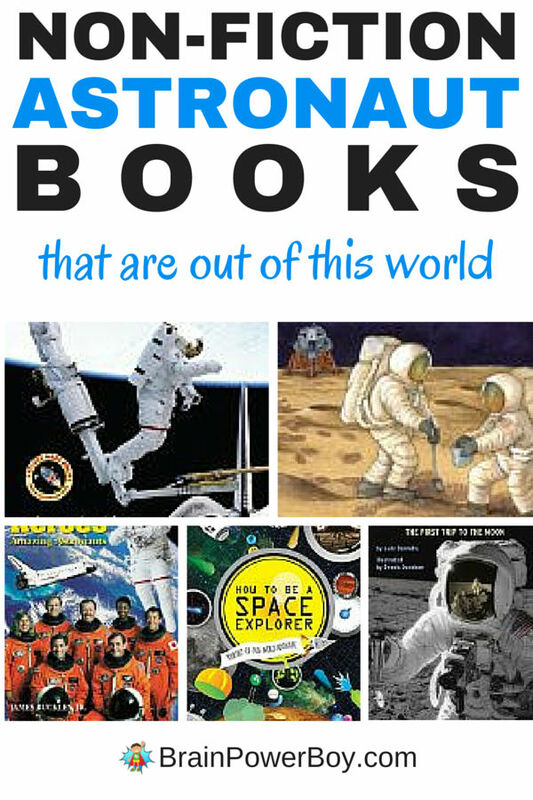 Other lists, like this Non-Fiction Astronaut Books list, are available by going to our big page of book lists for boys. My daughter’s going to be an astronaut for Halloween – might as well check out some books so she can learn a bit about them! Thanks for the suggestions! Hey that is great! I bet she will like them. What an amazing collection! We are learning about space at home, and wonderfully I found three other amazing posts on the theme on Made for Kids Linkup. My daughter would love reading these books. I’m glad you like the list and that your daughter will enjoy the books. Space is a fun and very interesting topic. For kids few years older, say 11+, try Chris Hadfield’s autobiography. Amazing, positive, and quite easy to read. Thank you for the suggestion. I really appreciate you taking the time to share it with other readers. My oldest went through a big space fascination stage a couple years back. Every book he was bringing home was related to space. He still enjoys a space book from time to time. I think he would really like Space Exploration. Thank you for linking up at Made for Kids! I was happy to link up 🙂 There are certainly a lot of good books out there. I hope he enjoys Space Exploration. Great list of books for boys. I will have to see if my library has any of them for my 10-year old. Thanks for sharing with #What to Read Wednesday. Hope you will link-up again next week.